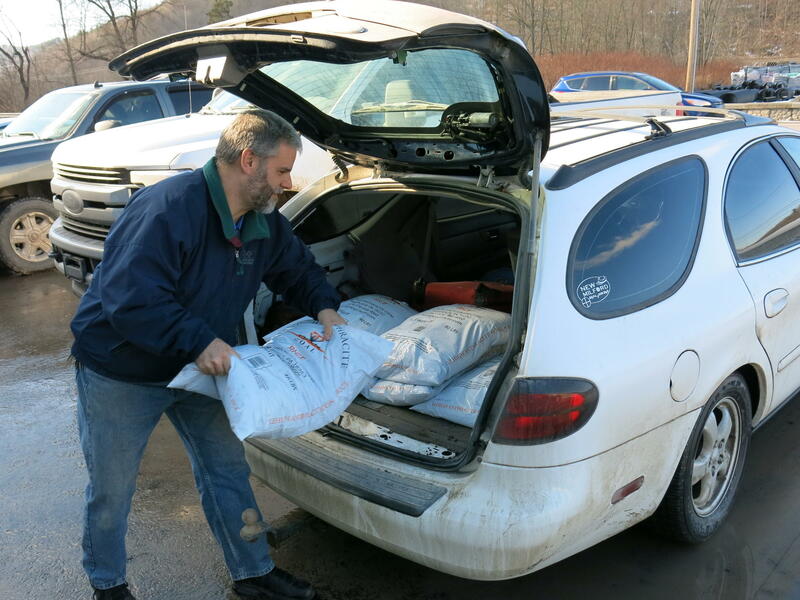 John Ord of Susquehanna, Pa., loads 40-pound bags of anthracite coal into his car. He's among the fewer than 130,000 households left in the United States that burn coal to heat their homes. It's a lot more work than most Americans with gas or electric heat go through to keep their homes warm. They can just set a thermostat and forget it. But Ord says this is actually less work than the wood stove he replaced last fall. "Between cutting it [wood], stacking it, letting it season, moving it into the space where you need to access it and then loading the stove," Ord says, wood requires a lot more handling. Ord's coal-burning stove burns 24 hours a day when it's cold. He likes the constant heat it gives off and says it's cheaper than his other options — oil and electric. Anthracite coal is mined in northeastern Pennsylvania. About 63,000 households in the state burn coal for heat. To demonstrate this, he goes outside and points up to a white chimney. "No smoke at all. There's no smell to it," says Ord. "It still emits quite a bit of dangerous sulfur dioxide, as well as heavy metals such as lead, arsenic, and mercury," says Tom Schuster with the Sierra Club's Beyond Coal campaign. He says anyone concerned about their contribution to climate change should avoid burning coal for heat. Those in the anthracite coal business counter that the industry is so small that it's not a big contributor to greenhouse gas emissions. "If you want to look at the major CO2 producers in the world, it's not us," says Matt Atkinson, co-owner of Leisure Line Stove Company in Berwick, Pa. "And even if we quadrupled our current sales, it still wouldn't be a problem." After decades of decline, fewer than 130,000 households use coal for heat today. Half of them are in Pennsylvania, and the state's coal industry wants to boost that. It has a plan to attract more customers. Atkinson is among those leading the campaign. He bought Leisure Line with a business partner in 2009 and says he got into the coal stove business after experiencing a friend's stove. Matt Atkinson, co-owner of Leisure Line Stove Company, in the firm's Berwick, Pa., factory. His company hopes to encourage more people to switch to burning anthracite coal to heat their homes. "When I opened the door, I felt this warmth that I had never felt before. ... And I was hooked instantly," says Atkinson. Talk to coal-heat advocates in Pennsylvania, and you'll hear this repeatedly — that there's no heat as intense as coal heat. It's clear that many people in northeastern Pennsylvania, the heart of anthracite coal country, have an emotional attachment to this fossil fuel. "You have people here that their great-great-grandfathers were miners. Their grandfathers were miners. It's a family of mining," says Andrew Meyers, sales manager for Blaschak Coal Corp. His company also is leading the campaign to attract new customers. "It's mostly about growing market share within the home-heating industry," says Atkinson. He hopes to attract a new generation of customers with the message that they can save money on heating their home if they choose coal. Kelly Brown stands in front of a pile of coal. Her family's business, F.M. Brown's Sons, has sold coal for nearly a century. In Reading, Pa., Kelly Brown welcomes the campaign. Her family's business, F.M. Brown's Sons, has sold coal for nearly a century and is one of the few to survive the industry's decline. "In this general area, there was probably about 50 coal companies. Slowly, one by one, they started closing up," says Brown. Now her company is the only one left in Berks County. Given Pennsylvania's abundant coal reserves and a bigger focus on improving coal's environmental record, Brown hopes the industry will stage a comeback. "I might not see it in my lifetime, but I think things will turn around," she says. So far the trend is not moving in Brown's favor. Even in Pennsylvania, the number of households using coal for heat continues a steady decline. In 1940, more than half of U.S. homes burned coal for heat. It was a big business and such a large part of the culture that a coal company even sponsored a popular radio drama. UNIDENTIFIED ANNOUNCER: Today Blue Coal brings you The Shadow's latest adventure - the "Bride Of Death." GARCIA-NAVARRO: But after decades of decline, only around 130,000 homes use coal for heat today. Half are in Pennsylvania. NPR's Jeff Brady reports the state's coal industry has a plan to attract a few more customers. 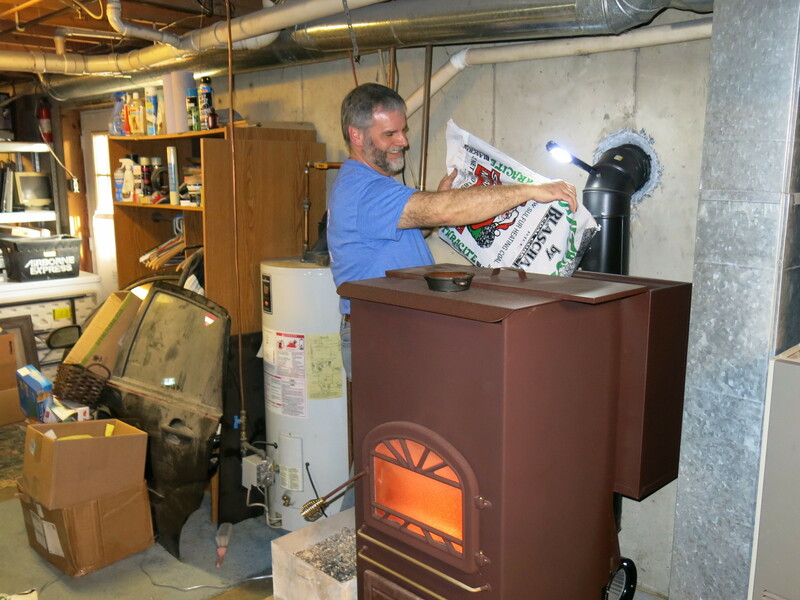 JEFF BRADY, BYLINE: A recent convert to heating with coal is John Ord. Every few weeks, he stops by a local hardware store in northeastern Pennsylvania to buy his coal. JOHN ORD: This is the whole glamorous part right here. BRADY: He loads 10 bags into the back of his white station wagon. It costs Ord less than $60. And he says that'll keep his house toasty for a couple of weeks in winter. At Ord's house, he shows off his new coal stove. It burns 24 hours a day this time of year. On the back, he loads a hopper. ORD: You'll take the lid off. BRADY: He lifts the 40-pound bag chest high and empties it to feed the stove for another few days. It's more work than just setting a thermostat. But Ord says this is less work than the wood stove he used to have. ORD: Between cutting it, stacking it, letting it season, moving it into the space where you need to access it and then loading the stove. BRADY: Ord also likes the constant heat his coal stove gives off. And he says it's cheaper than oil and electric. The coal he uses is different from what's burned in most power plants. 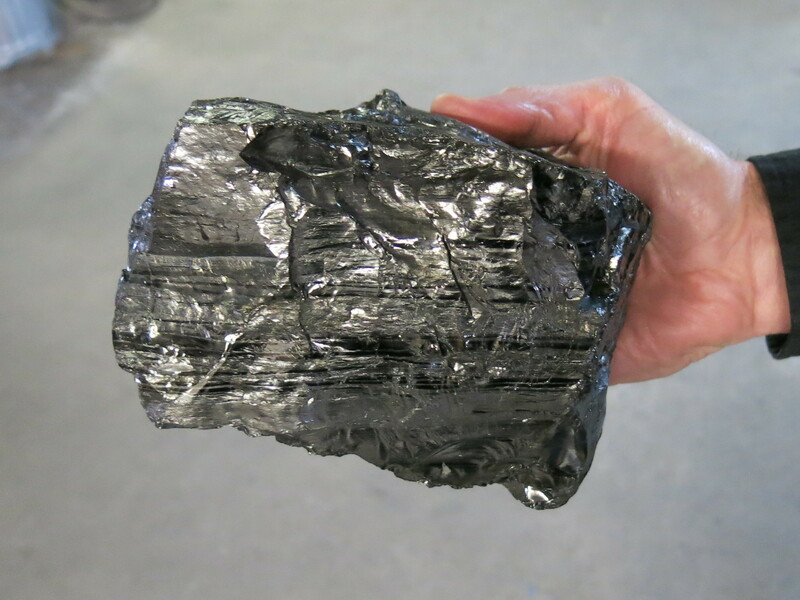 Northeastern Pennsylvania is very proud of its anthracite coal, which is shinier and harder than you might expect. Ord says it burns cleaner, too. He heads outside to show me. ORD: That's what you got coming out of the chimney. You can't even tell. BRADY: OK, so no smoke or anything. ORD: No smoke at all. There's no smell to it. BRADY: But burning anthracite coal does emit more carbon dioxide per unit of heat than just about any other fuel. That makes it a contributor to climate change. Ord bought his stove from a company called Leisure Line. 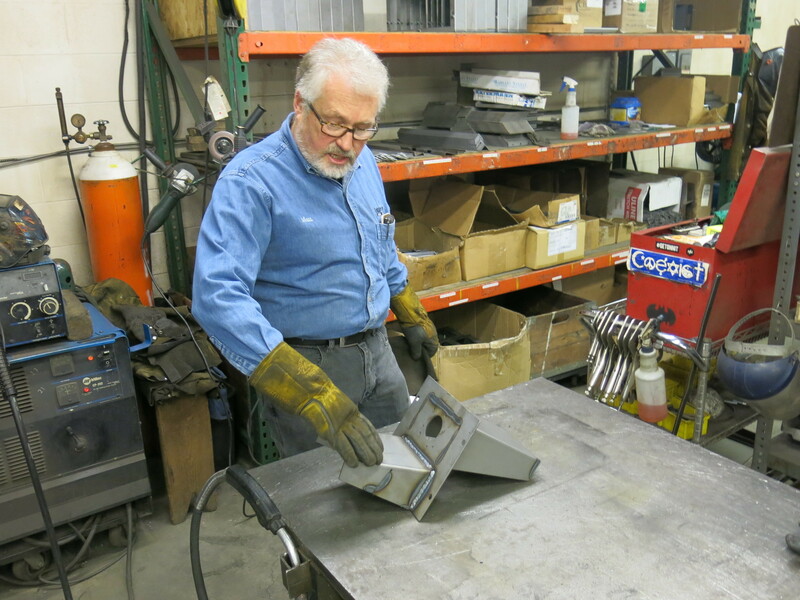 It has a small factory in Berwick, Pa.
BRADY: Co-owner Matt Atkinson fires up a welder to show how the stoves are built. He and a business partner bought the company a decade ago and says they sell 500 to 600 coal stoves in a typical year. Asked about climate change, Atkinson says the anthracite home-heating business is so small that it's not a big contributor to greenhouse gas emissions. MATT ATKINSON: If you want to look at the major CO2 producers in the world, it's not us (laughter). And even if we quadrupled our current sales, it still wouldn't be a problem. BRADY: Increasing sales is a goal. The local anthracite coal industry plans a marketing campaign to boost its image. ATKINSON: It's mostly about growing market share within the home-heating industry. BRADY: He hopes to attract a new generation of customers who want to save money on heat. In Reading, Pa., Kelly Brown welcomes the campaign. 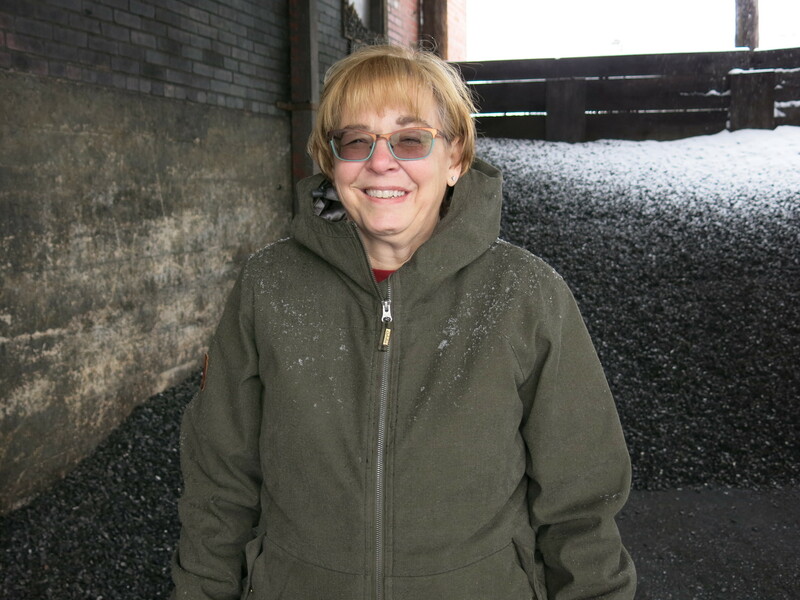 Her family's business has sold coal for nearly a century and is one of the few to survive the industry's decline. KELLY BROWN: In this general area, there was probably about 50 coal companies. Slowly, one by one, they started closing up. I think we're the only one in Berks County anymore since - for the last 10 years. BRADY: Brown says maybe a marketing campaign will turn the industry around. And maybe they'll take a cue from some of those old radio jingles like this one, courtesy of the Pennsylvania Anthracite Heritage Museum. UNIDENTIFIED PEOPLE: (Singing) Blue Coal's dependable - can't be beat. UNIDENTIFIED PERSON #2: Steady heat. UNIDENTIFIED PEOPLE: (Singing) Just pick up the phone. UNIDENTIFIED PERSON #1: Number please. UNIDENTIFIED PEOPLE: (Singing) Tell your Blue Coal man... Transcript provided by NPR, Copyright NPR.